Annabel Anderson it could be said has been bouncing off the rev limiter for most of her life. In her early twenties she found herself in a situation that many people who have hit it too hard for too long find themselves in – physical burnout. Demonstrating that whilst it was not just a mere speedbump, these setbacks can be overcome, for Annabel is of course now one of the most accomplished paddlers on the water. We spoke to her about treading the line of peak performance. 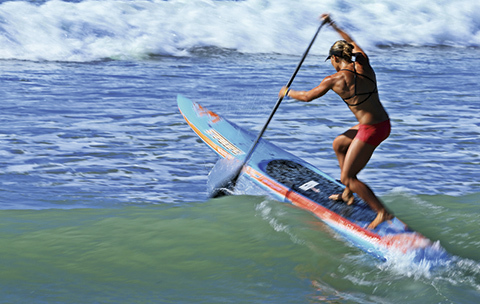 SUP: Looking at the year as a whole, for how long, and how many times will you aim to be hitting peak performance? AA: This will depend how long you have been competing, how much you have been traveling and what other external factors have impacted upon you. In most endurance based sports, you’re pushing the limits with three key peaks in a calendar year. My year is chunked out into four key phases, early preparation (my NZ summer), early competition phase (first half of my international season), key competition phase (second half of my international season) and my off season which is my annual chance to run through the hills, ride bikes and spend time at home. When you come through the other side of a period of racing and operating at full capacity, what steps do you take to come down from it? Most athletes will have a period of recovery, which is necessary for mental and/or physical recharge. Often I do not have this luxury as I leave NZ for two thirds of the year. When I’m departing one place, I’m on my way to the next. I have put some procedures into my planning to ensure it’s just ‘business as usual’. It’s not an ideal situation but it’s something I’ve learned to deal with. Psychologically, what are the warning signs of burnout? And can you suggest some tips to sort that out? There are many different signs of burnout and this is resonant of anything in life. Lethargy, lack of motivation, for something you usually love to do, fear, anxiety, depression (yes – it’s a hidden, unspoken topic that affects athletes too) not being able to push yourself physically are all signs that you need take a break and put the ambulance at the top of the cliff. Try to find the reasons why you loved doing it in the first place and reset the priorities of what you’re doing it for, or what you’re wanting to achieve. As with all things, these will change and be fluid over time depending on what else is going on in your life. What do you think about the long term effects of red-lining the body year on year? Smashing your central nervous system repetitively will have an impact over time, not necessarily immediately. As with high intensity interval training based regimes (i.e. Cross Fit style land training) the body will always need a period of recovery to reap the gains of the training that has just been completed. The methodology behind the philosophy of ‘training’ is to break down muscle tissue so that it rebuilds stronger as well as neuro-muscular patterning and aerobic/anaerobic conditioning. If you apply this, you’ll understand that recovery is just as important as the training. 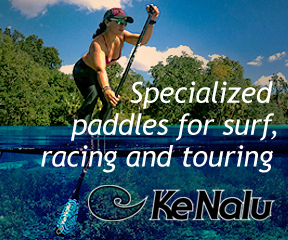 Have you, or a paddler you know well suffered a shoulder impairment that prevented paddling? Shoulder impingements are the hidden conversations that many people are having with themselves, but not openly admitting too. In the next 12-24 months we will see an unprecedented rise in the reporting of overuse injuries associated with SUP. Most of this is from incorrect set ups (paddle lengths) and poor stroke mechanics from the outset. As with any injury reduction of pain and inflammation are first and foremost before beginning a period of rehabilitation on dry land. When hitting the water again, one must be prepared to change what caused the injury in the first place, otherwise it’s a vicious cycle of injury-rehabilitation-injury. Only the individual can choose to change this cycle of destruction. Can you talk about signs symptoms that a paddler should look out for that would suggest they are over reaching? By over reaching I am assuming you are meaning that the entry point of the blade is too far out in front? A stroke that does not engage power as soon as the blade touches the water may be suffering from ‘over reaching’. There are many different philosophies associated with perceived ‘stroke technique’ in this sport. Due to the lack of credible and biomechanically sound information people have sought refuge in references from the internet. Be careful as to who you reference information from if it is from a free source. My suggestion is to ask yourself what and who the source is where the information is from. If you’re in pain or feeling uncomfortable, something is likely not as it should be and if you continue to do it repetitively, you will do damage over time. Would aspiring races to well do periodise their workouts or smash a current popular high intensity workout? Weekend warriors and aspirational racers are athletes in their own right which means they should approach their year in a similar fashion to those doing things more seriously, although in a paired back fashion. Going and smashing yourself session after session may win you bragging rights with your mates, but it’s not going to win you any races. 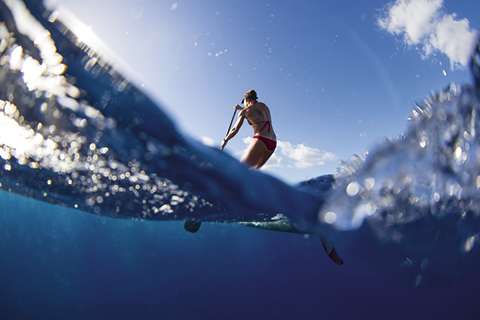 Paddle with your head – not with your ego. How do you deal with the problem of fitting regular surfs in and around your training program? Surfing features in my schedule as importantly as specific training sessions. This is as much a sport rooted in surfing culture as paddling culture. If you can’t surf, you’re not going to be the best. Ironically, the best surfers happen to also be the best racers. Finally, as well as the advice above, what words of wisdom would you have for a paddler that has ruined themselves with too much sustained effort and is now in layup? Look at the reasons why you are now laid up and grumpy because you can’t go and do what you love to do. What was the cause? Was it something that was avoidable? Was it a situation you didn’t need to put yourself in? Did you know that something was not quite right, but you chose to ignore it? You’re your own guide; treat your body with the respect it deserves as you only have one. Maybe operating at 80% will achieve the same result as 100% but not put the same amounts of stress on your body.